A good way to think about the state of economics, is to note the disparity between the treatment of the Laffer curve and Nobel prize winning economics. In this year's Nobel highlighted work that formalized the effects of search on labor dynamics. Basically, if you have people with unknown productivity searching for jobs, they should not take the first job offered; firms should fire those people with below-average productivity. That's a good insight. Too often people look at the unemployed as a homogeneous lot, who are affected by labor demand like plankton affected by the tides. Yet as a formal model, it is ambiguous, as all formal economic models are. First-order and second order effects offset each other, making their relevance an empirical matter. Thus, wage subsidies, minimum wages, laws making it difficult to fire employees, have ambiguous effects on society. Mortensen's 1970 model did not make it any easier to answer these questions, which is why societies are not any clearer on how to best alleviate unemployment today as they were in 1975. He just noted unemployment is rational for someone waiting for a good job. Again, a good idea. Art Laffer famously presented his idea that tax revenues are at first increasing, then decreasing in tax rates, on a cocktail napkin, when arguing about the president Gerald Ford's tax increase (ie, 1974). This too is a good idea. This too, is an empirical issue, as we can be either at a point where revenue is increasing in the marginal rate, or decreasing. Even if the curve is increasing, its slope is important, especially because maximizing government revenue is not the same as maximizing societal welfare. Yet Art Laffer will never win the Nobel prize. His idea is as insightful and has the same empirical limitations as the modeling of labor search on unemployment or any of the other economics Nobels. If you think Laffer's point is too uncertain to be Nobel-worthy, you are putting to much confidence in the Nobel brand (they are all that uncertain); if you think Laffer's point is not sufficiently rigorous, I think you are confusing rigor with understanding. Nobel prize winning work has the imprimatur of 'science' because it spawns elegant models. The models are no more predictive or instructive than the Laffer curve, just they lend themselves to infinite amounts of rigor so it can then it looks like physics, which is the end game (looking like physics). Rewarding formalism that is no more precise than a Laffer curve has been really bad for understanding economic systems. The Laffer curve is marginalized by economists for its unpretentious honesty, whereas the dynamic general equilibrium search models are more misleading as to how precise they are or can be. This makes economics less fruitful. 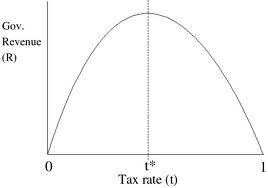 Speaking of pretentious uncertainty, is there any reason to believe that the Laffer curve has derivative zero at exactly one point? On a related note, see Seth Robert's blog post The Nobel Prize: Not Helping. He argues that the Nobel prizes are awarded for high prestige work, and prestige is inversely related to practical value. And speaking of practical value, there's virtually no evidence that the federal government can increase its revenues by reducing the federal tax rate... and yet Laffer's cocktail napkin is embraced by politicians who are interested in neither maximizing government revenues nor increasing taxes. Fascinating. In a world where the government confiscated 100% of the wealth of its citizens, Laffer's brilliant observation would indeed be of the utmost importance. I guess that world is conservative fantasyland. my point was not where we are on the Laffer curve, merely it exists, and implies raising tax rates does not necessarily increase tax revenues. The same kind of ambiguous implication resides in the work of Krugman and Stiglitz. I hope you know more about finance than you do about the work of Diamond-Mortensen-Pissarides. Their prize was not for job search. That was Stigler in the early 1960's. They won the prize for integrating job creation, job destruction, quits, vacancies, job search into a consistent model. Workers look for jobs and firms look for workers, and how this matching process is affected by shocks to the economy. It was a great breakthrough, and a well-deserved prize. Laffer was not the first to note that a tax rate of 100% and one of 0% produce identical revenue. He just formalized it in a picture. Yes, job search is an extension of stigler, just as Laffer borrowed from someone, and Markowitz from Shakespeare (and the Bible) but the same could be said for every idea (Newton's "I stand on the shoulders of giants"). It remains a formalization of a straightforward intuition--like most good ideas (with hindsight)-- and there is no greater consensus, or precision on issues is labor economics or macroeconmics because of it. A good idea, but I think no better than the Laffer curve. Speaking of the Laffer curve, there was Mankiw's article in the NYT about working less if taxed more. Of course, in a progressive tax system, taxes act as a deterrent to extra work for high-earners and make the same opportunities more attractive to people with lower marginal rates (see post). Not to mention that when there's hightened unemployment, it ends up redistributing work from those with high marginal rates, to those with low rates. If marginal rates are a good proxy for income, then it all also becomes a good way to redistribute work to those that need it. Too bad it won't win a prize, it's probably one of the most interesting and useful things I ever encountered as an econ undergrad. I'd like to mention that last year Oliver Williamson won the Nobel and I can't find a single equation written by him. FINALLY A VOICE OF REASON!!!!!!!! I AGREE 100% with Falkenstein!!!!!!!!! these people are not victims - THEY ARE DEADBEATS!!!!!!!!!!!!!!!!!!!! if you can't afford the house - GO RENT like you probably should have in the first place!!!!!!!!!!!!!! McMansions are NOT an entitlement!!!!!!!!!!!!!!! By the way: http://www.theatlantic.com/magazine/print/2010/11/lies-damned-lies-and-medical-science/8269 I am sure you'll like that article.